There are countless articles about the benefits of a morning workout floating around the internet, but I found out the numbers of topics regarding an evening workout are far less than a morning workout. Does it mean exercising in the morning is a lot easier to bring you a leaner body and cultivate a consistent routine? Well…I have tried fitting fitness into my a.m. and p.m. routine as well. The question is, what are my own best hours to work out? 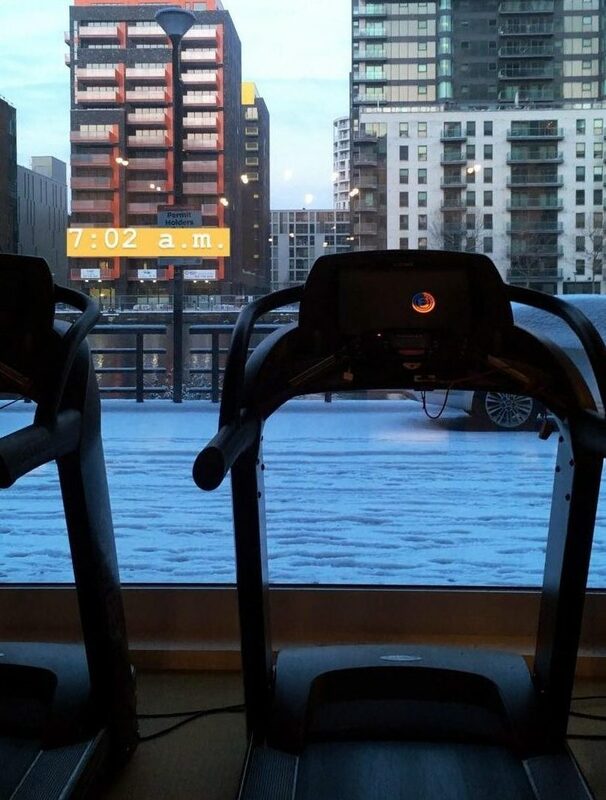 I usually schedule my workout in the early morning, right after the gym opens. I even have an alarm set for 6:50 a.m. on my iPhone, named ‘Another sweaty session’, to remind myself to hit the gym. One of the most worries people would have is that, how could I have much energy to do a proper workout when my body is physically tired? Sometimes, I do have moments like there is a devil inside stopping you to get yourself changed into fitness gear, but for me, to fight and defeat the disturbing devil, a strong black coffee or a powerful energy drink would effectively help. Self-control is hard when I feel unmotivated. Interestingly, I find myself having less excuses like ‘Let’s do it tomorrow!’ to skip a workout, properly because my brain has already built in a habitual system. During my uninspiring days, I’d still force myself to go doing some quick and easy stretching exercises or stepping onto an elliptical machine for 30 minutes. Since the workout is scheduled as the first thing in the morning, it certainly supports me to stay calm and strong mentally throughout the day, and also, allows me to focus on the positive even when I am stressed out, instead of having a negative self-talking. If I work out in the morning, 99.9% of the days tend to be more productive regardless of how much I sleep. What about scheduling an evening workout? Does it work the same way? My workout schedule dramatically changed after I moved out of my old apartment. The gym where I used to go is fully equipped with machines and packed with plenty of highly energized people. The gym that I currently go to, only has the basic equipments such as treadmill, elliptical and pull-up machine etc. I could say this is a fitness center that designed for a home-use? Due to a big change in the environment, I find extremely difficult to have a workout that made me leave the gym with a huge satisfaction; hence, I shifted my work out to a p.m. routine. I first tried to schedule a workout around 4 p.m., because I found myself I could not complete any important tasks after a big satisfying lunch, and at the same time, I was still able to send a couple of necessary emails before I left the messy desk for an exercise. The workout itself was good but not the best, and the training frequency has become less and less, whereas I could go to the gym in the morning up to 6 days a week. I believe the reason is, my mindset was set to prioritize the time for work instead, then I would have many excuses like ‘The gym’s environment is not competitive enough’ or ‘I have a deadline to meet, let’s finish the work first’, and eventually, I could not make it to the gym most of the days. Most of the excuses are surrounded by two things, gym’s environment and work schedule; then I decided to join a decent gym near my place, I thought I should have felt motivated to go there 5 days a week around 8 p.m. and smash a good workout. Considering the fact that I have to pay a monthly fee for a gym membership, I thought I’d go there more often and the result is, I barely go! I did hit the gym a few times at night. Do I particularly like exercising in the evening? I liked it at first as it can boost my mood and energy, but ironically, it makes me very excited and that causes me an insomnia; the exercises that I do regularly is either an elliptical workout, HITT running workout or weight training; all of them is hardly counted as an exercise for calming and relaxation. I personally enjoy morning workout more because it can boost my energy level and help me survive in my busy schedule, without having any sleeping difficulty. No matter what your fitness goal is – what matters is you find your own routine that works well for you and motivates you to have a fulfilling workout.